The top U.S. diplomat to Africa urged Nigerians to demonstrate their ability to hold fair and democratic elections as the country prepares for legislative, presidential and state balloting scheduled for April 2, April 9 and April 16, respectively. Speaking to reporters via teleconference March 29, U.S. Assistant Secretary of State for African Affairs Johnnie Carson said it is “absolutely essential” that Nigeria hold better elections in 2011 than it held in 2007. In 2011, the Obama administration wants to see Nigeria reverse its “trajectory of bad elections” and “substantially improve its election management and processes,” he said. Carson warned that a flawed electoral process will lead to a loss of confidence by Nigerians in their leaders, their country’s governing institutions and democracy itself. “This is an opportunity for Nigeria to demonstrate its capacity to both manage and hold democratic elections, which are the desire of the people,” he said. 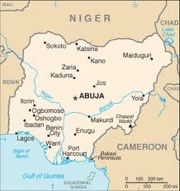 Although the level of violence in the run-up to the elections is not as serious as it was in 2007, Carson said the violence already perpetrated has been “too much.” He called on Nigerian security authorities to do everything they can to ensure the safety of polling places and prevent violence, harassment and intimidation against Nigerian voters and candidates. “Violence has no place in a democratic society or in a democratic electoral process, and all of the country’s leaders … must work to do everything they can to make these elections as free of violence and intimidation as possible,” he said. The United States has supported Jega’s efforts through technical assistance and funding. Carson urged all election officials to respect Jega’s leadership and direction, and added that Nigeria’s state-level election officials will also be scrutinized for their conduct. Carson said there are 17 presidential elections scheduled to occur in Africa during 2011 and the Obama administration will be watching all of them. He said that to strengthen democracy, the focus should be on the institutions rather than the individual candidates. All Africans have a right to participate in the election of their local, regional and national leaders, and those elections “should be transparent, fair and credible,” Carson said.